Bowder Stone – Keswick Launch Co. 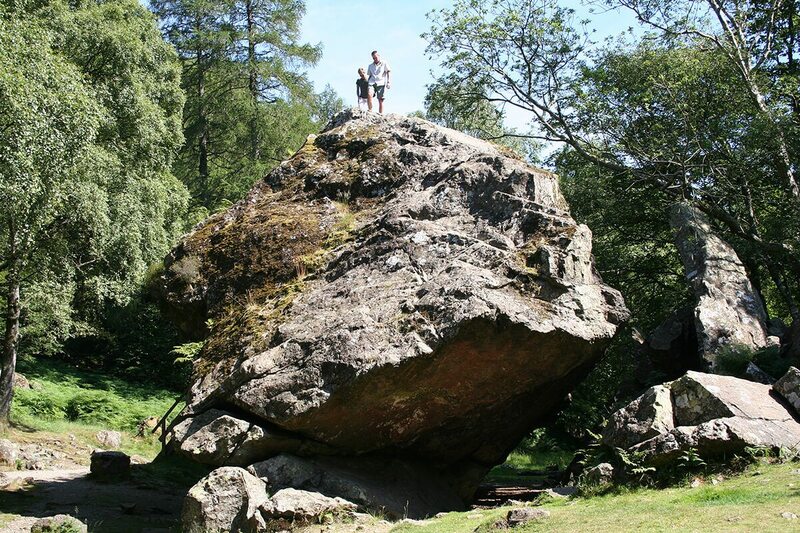 In the early 1800s this enormous boulder in the Jaws of Borrowdale was billed as a ‘must-see’ for visitors. The Bowder Stone was established as a tourist attraction by the eccentric wealthy off-comer Joseph Pocklington in 1798. He’d already built a house on Derwent Island, diverted Barrow Cascade to make it more impressive, and created a tradition of armed invasions of his island as part of the Derwent Water Regatta. His approach to the Bowder Stone was characteristically unsubtle. He set up ‘a crazy ladder’ for tourists to stand on the summit, built a mock hermitage nearby and erected a ‘druicial’ standing stone. He also built a cottage where he installed an old woman whose duty was to ‘lend the place quaint atmosphere’. This tradition continued throughout the Nineteenth century. You can still climb to the top via a ladder staircase today. Stop at Lodore. 45 mins walk from jetty.